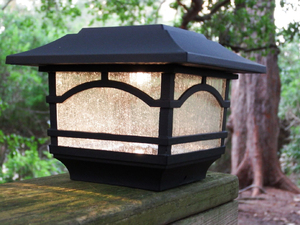 The Solar Post Cap and Deck Railing Lights - 2 Pack are great for everything from accenting decorative elements of your deck, to illuminating dark paths and fencing. Whether you are trying to show off your deck or prevent trips and falls, the Mission Style Solar Post Cap & Deck Railing Lights are for you. • Outputs 15 lumens per post cap! Is fixture plastic or metal? This fixture is composed of durable metal and seeded glass. Thank you for your inquiry!